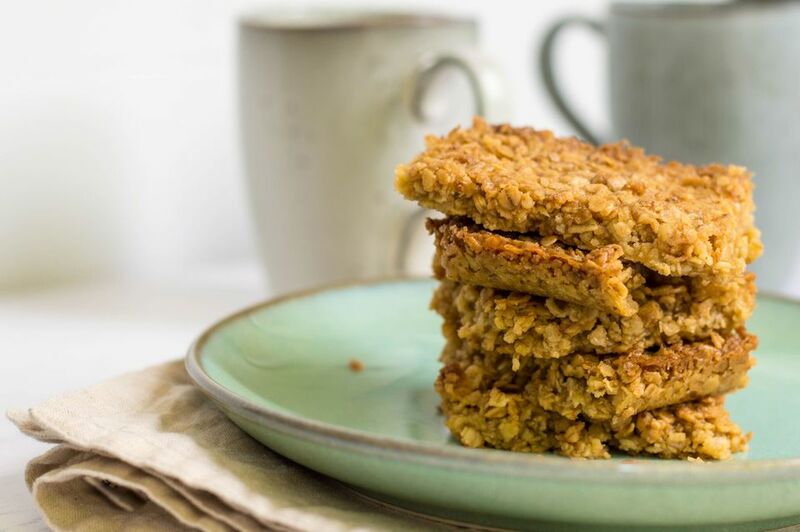 Making a great British flapjack is not difficult and it can be ready in less than 30 minutes This traditional favorite is at home on the tea table or in a lunch box or picnic basket. In the U.S., a flapjack is a thick pancake, not a tray bake. If you are not sure of the difference, then take a look at what is a flapjack? In addition to being an easy recipe, there are other great reasons for making a flapjack—it is inexpensive, delicious to eat, and also has many variations. Although there is sugar in the flapjack, it also can be considered somewhat healthier than many other cake bars. The reason? A flapjack mainly contains oats that are full of iron, zinc, and vitamin B so you can eat them without too much guilt. Heat the oven to 350 F/180 C/Gas Mark 4. Use 1 teaspoon butter to grease a 9 x 13-inch baking pan and line the base with parchment paper. Place the syrup and 6 ounces of butter into a large saucepan and heat gently, stirring well, until the butter has melted into the syrup. Make sure you add all the golden syrup, sometimes it is hard to get it exact, and more is always better than less if you want your flapjack gooey but not falling apart. Put the oats into a large bowl, add a pinch of salt and optional ginger and then pour over the butter and syrup mixture and stir to coat the oats. Pour the mixture into the prepared baking pan and spread evenly making sure the surface is even. Bake in the heated oven for 25 minutes or until golden brown. Remove from the oven while the flapjack is still slightly soft, it will harden once cool. Place the pan on a wire cooling rack and cut the flapjack into squares, but leave in the tin until completely cold. The flapjack keeps well stored in an airtight tin. The recipe above is a traditional flapjack, but there are also many, many other options. The method of making these alternative flapjack recipes is the same as above, just vary the quantities and ingredients as follows. Coconut Flapjack: Use the same amount of oats and add in 2 ounces/55 grams of sweetened dried coconut and continue with the recipe. Apricot and Honey Flapjack: This healthier recipe than the traditional flapjack is made by using 3 1/2 ounces/100 grams butter with 3 ounces/85 grams soft brown sugar and 3 tablespoons honey, 12 ounces/350 grams oats mixed with 3 1/2 ounces/100 grams finely chopped dried apricots, and 1 small mashed banana. Nuts and Seeds Flapjack: Add 2 tablespoons chopped mixed nuts and 2 tablespoons mixed seeds such as pumpkin and sunflower to the core mixture.